The Generic Firearm Bill of Sale is a legal document and is an agreement which is used when selling and purchasing a firearm, pursuant to the law of the respective State. Since every country or State of USA has its own law, it is important to study the law of that State or country to follow the laws and rules of the concerned State or the country. He is not forbidden and restricted by law from possessing a firearm. He was never convicted by a court of law for an imprisonment for more than one year. He is not an absconder from the justice. He is not an addicted or an unlawful user of any drugs or narcotics. He has never been declared mentally sick or admitted to any mental hospital or institution. He is not an alien who is residing illegally in the USA, or he has not entered the USA with a non-immigrant visa. He has not been dismissed from the Armed Forces in a dishonorable way. While holding the citizenship of the USA, he has not renounced his/her citizenship. He has never been ordered by a court not to harass, embarrass or stalk to his intimate partner or the son of such intimate partner. He was not convicted of an offensive crime of domestic violence. 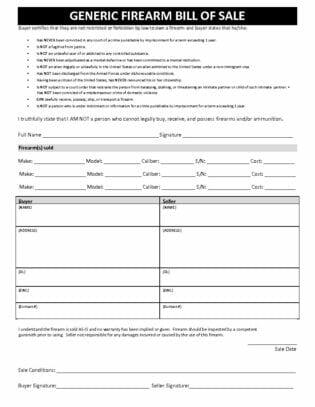 He is legally authorized to possess, receive, transport or ship a firearm. He has not been summoned by a court of law for a crime punishable for more than one year. In the Generic Firearm Bill of Sale, the buyer gives a declaration that he is not a person who cannot buy, receive or possess an ammunition or firearm. The buyer will give his full name and put his/her signature at the end of this section. There are three columns, make means the name of the company, the next is the model and the third is the serial number while the forth is the cost at which this firearm has been sold. 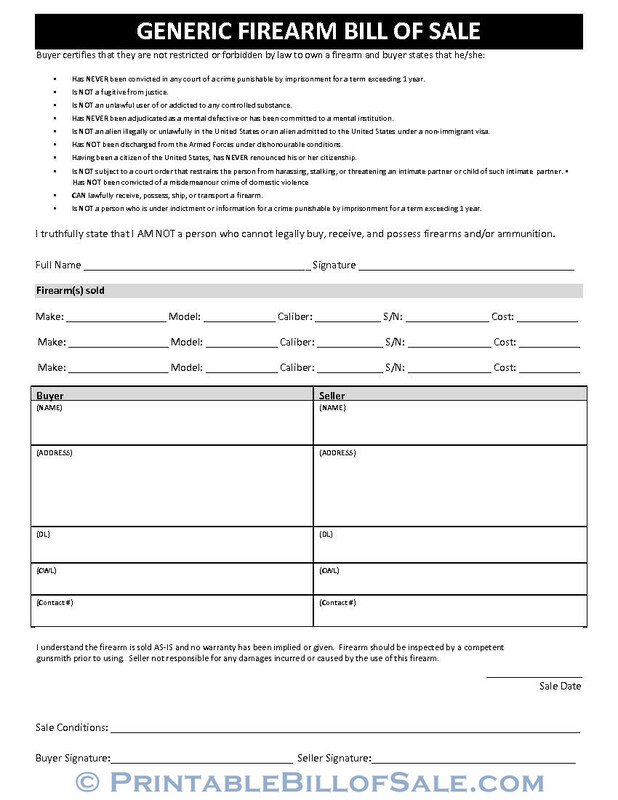 There are three separate lines for these details, which mean that on this form you can sell and buy three firearms. In this section, there are two columns, one is meant for the buyer and the other is for the seller. Names and addresses of both the seller and the buyer are to be given along with their DL numbers and CWL numbers; and the contacts of both the parties are also to be given. In the end, there is an understanding by the buyer that the firearm is being sold on, “as is basis”, and no warranty is given. It is also advisable that firearm must be inspected by a gunsmith before using. The seller will not be responsible for any damage caused as a result of using the firearm. Sale date is to be given. Condition means the working condition of the weapon. Any defect or any need for repair of the firearm should be mentioned clearly. The buyer and the seller will put their signatures.